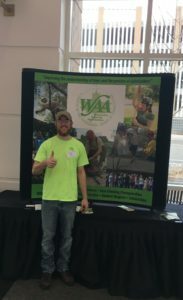 We recently returned from the WAA Conference in Green Bay! It’s a 3 day conference with speakers from across the country, keeping us up to date on the latest trends in the industry. A trade show floor also offers the opportunity to see the latest in tree gear, allowing us to be safer and more efficient. WAA is a great event that we look forward to each year! Previous Post2017 Year in ReviewNext PostConcrete in a Tree?